I know what you’re thinking: marathon training, Summerdale alligator farm, and vegan food? How can these coexist in a single blog post? Here’s my answer: it’s possible! I’m a vegan who’s training for a marathon, and I’m also fascinated by big, magnificent creatures that coexist next to us humans on this planet! It’s hard to believe that I’m already five weeks into my marathon training! The good news: the way my training has been going so far gives me confidence that I’ll be strong and ready to go when the big day comes (November 10th in Pensacola, Fla). I’ve been slowly cranking up my weekly mileage peaking at about 35 miles this week – which is nothing to some seasoned runners out there, but kind of a big deal for me because just about a couple months ago I was running only 10-15 miles a week. The running wisdom suggests that we should only increase our weekly mileage by 10-15 percent max to avoid injury. I admit I don’t always follow this advice because adding another mile or two to an average run seems no big deal when I’m feeling great, but nevertheless, I’m not the person to question the universal truth. My Sunday long run was 12.25 mi at an average pace of 8:54 min/mile – which is better than my previous 10 mile run that I did at 9:14 min/mile. Once again, my improving times and energy give me confidence (but not overconfidence! ), and I’ve got my newly adopted plant-based vegan diet to thank for it! 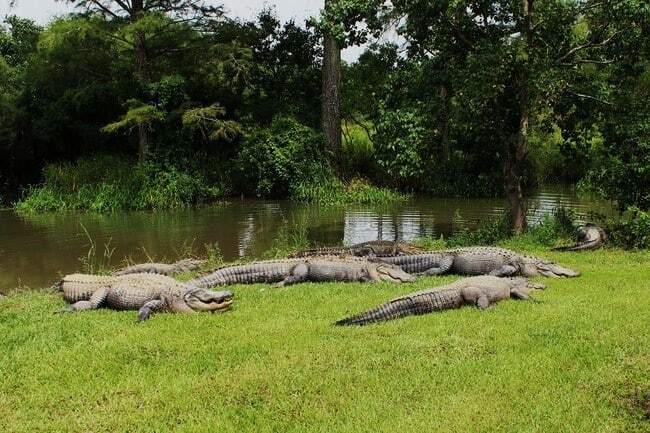 And now, ladies and gentlemen, – bring on the alligators! We live in Southern Alabama on the coast of Mobile Bay – a place where heat and humidity are through the roof in the summer, but for a number of living creatures these conditions allow them to thrive! 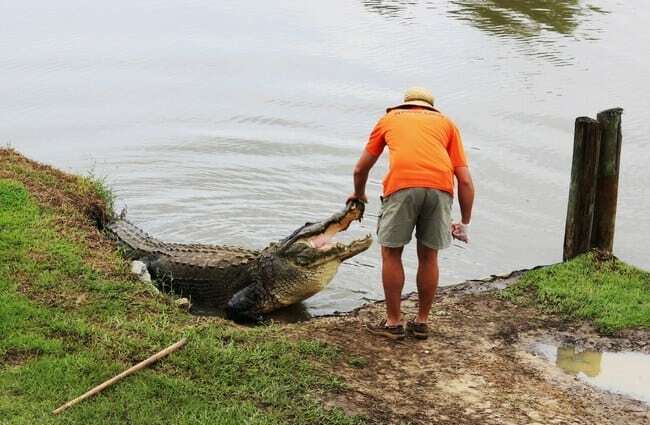 Alligators are a great example. No, this is not what I see on my lawn looking out the window every morning – but what if I lived closer to a swamp? 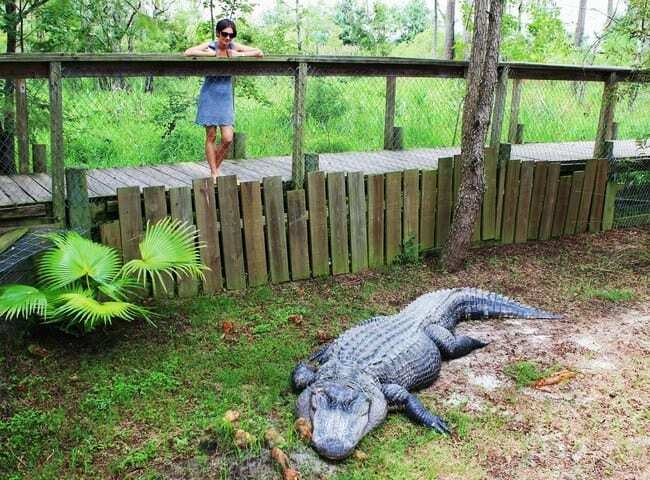 These big guys reside at a rescue alligator farm in Summerdale, AL called Alligator Alley. This is a great tourist attraction if you are in the area! 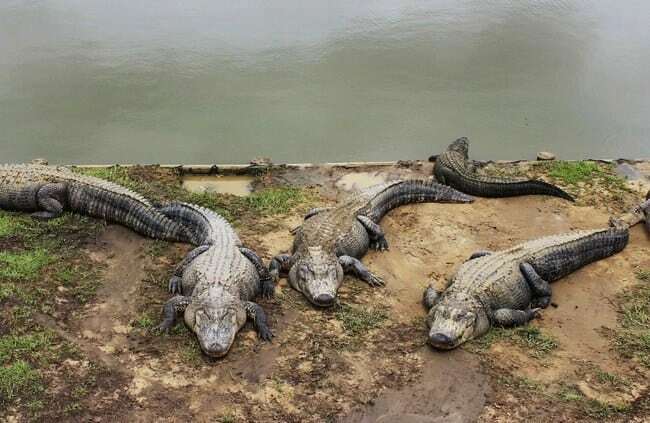 They have about 400 alligators of all ages and sizes living in pretty nice conditions in a long lake and adjacent swamplands. 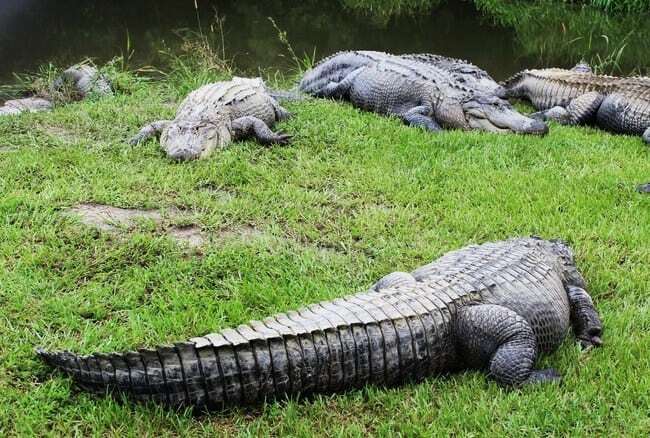 While their maximum length can be up to 14 feet, it’s rare to find alligators that grow to be that long. The babies are kept separately until they reach a reasonable size, and then allowed to join the other big guys. Basking in the sun, y’all! 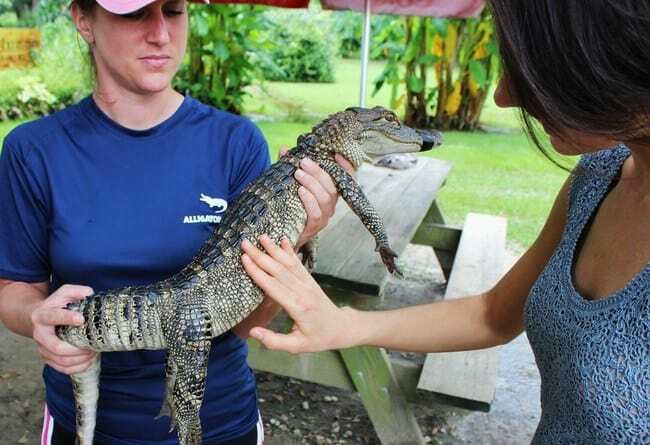 The Summerdale alligator farm was opened in 2004 to provide home to big alligators from all over the South that otherwise were bothering people and animals in parks, rivers, and swamps. Apparently, any alligator over 4 feet long needs to be removed from the wild if he proves to be a nuisance to humans and their pets. I might not be a fan of the idea of taking an animal from a place in the wild that he calls home, but it’s more humane to transport him to a safer area than, well, kill him… At the Alligator Alley in Summerdale, the conditions created for these alligators are as nice as they can get: the area they live in is large and quiet; they get fed three times a day at 11 am, 1 and 4 pm; the fences on the property – although perfectly safe for people – don’t seem like they are creating confinement for these guys. A stare-down contest I wouldn’t care to win! Naturally, I had to pet this little guy that turned out to be 2-3 years old. The biggest guy on the premises is named Captain Crunch. This gator weighs over 800 pounds and is over 13 feet long. Back in the day when he was first captured, his bite strength was measured to establish a new world record that stands to this day – 2982 pounds! To compare, human limbs and bones break at around 400-450 pounds applied to them. Today Captain Crunch is one of the most popular gators with tourists, and he even gets to reside in his personal quarters in the swamp! Captain Crunch in all of his glory! He looks even bigger in person. And just as we were wrapping up our visit, we noticed a few longhorn bulls grazing nearby. Their horns looked really impressive, but these guys turned out to be very peaceful! It was actually kind of puzzling to see one of the bulls start licking another bull’s sides like he was a piece of candy… have you ever heard of such behavior among bovines? I’m sure there’s no friendly licking going on among alligators! This guy let me pet his forehead for a little bit – until he turned his head slightly, and I had to jump aside not to be hit with his horns! 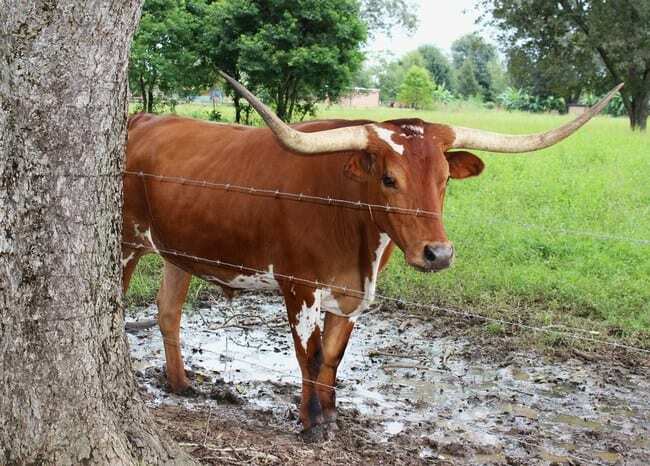 All in all, the Alligator Alley Farm in Summerdale, AL is a great place to visit if you’re in town! Animal lovers of all kinds will be thrilled to meet these magnificent creatures in conditions that are very close to their natural habitat at this Southern Alabama attraction. Stop by close to their feeding times (11 am, 1 and 4 pm) to get the most out of your visit! Week 2 of Marathon Training. The Goodness of Carbs. Also: Hummingbirds! Week 3 of Marathon Training. Our Surprising Vegan Experience in Pensacola, Fla.
Week 4 of Marathon Training. Are All Runners Smug? Tagged marathon training, Pensacola Marathon 2013, traveling. Bookmark the permalink. Hi Alina – I found your blog recently, and got really excited, because I’m also a vegan training for a marathon! This will be my 4th, and while I was predominantly vegan while training for the first 3, I’ve newly committed myself to veganism while I train for this race. I have a (rather strange) question for you. As someone who eats A LOT of produce, I often find myself having to make several bathroom stops on a run…usually after only 2 – 3 miles, and sometimes several times on longer runs. I think it’s primarily because of how much fiber is in my diet, but it can make runs really tough (and uncomfortable), and I’m frustrated/worried that it affects my endurance, since I have to stop much more frequently than I really should. Do you ever have this problem? If so, do you have any tips for me? I’ve experimented a little bit with different meals before long runs, and so far on my race days I’ve had pretty good luck, but I’d really like to figure out how to run more than 3 – 4 miles without having to stop and use the bathroom! Sorry for the rather awkward/private nature of this post…I hope you don’t mind! It’s not often that you find a vegan marathoner to compare notes with! Hi Kate! I’m very excited that you found my blog – it’s always great to find like-minded people! As for your question, I don’t think it’s all that strange or awkward: most runners will agree that sometimes our stomachs can start acting up right in the middle of an important run, and it can be a big bummer. It sounds like your stomach might be a little more sensitive than on average. A question: what time of the day do you usually run? In my experience, I do the majority of my runs in the morning, and as soon as I get up, I have to go to the bathroom (well, it’s hard not to get technical here 🙂 ), sometimes even twice, so that takes care of the problem. What foods have you tried eating before runs? You might be better off reducing the amount of fiber that you consume the night before a long or intense run in the am, for example, by having regular pasta instead of whole-grain, white rice instead of brown, etc. Don’t worry, they are not going to derail you on your way to getting healthier! If you can’t run in the morning, try not to eat a lot of fiber at least 2-3 hours before your afternoon or evening run. I can see how frustrating your bathroom stops can be for you, and I can only hope that my advice turns out to be helpful. Keep up the good work, experiment with different foods, and I’m sure you’ll find a solution! And let me know how your training and racing goes!